The Clean Energy Finance Corporation has provided a $20 million loan facility to Australia’s Carnegie Wave Energy that will likely see the company’s first commercial-scale wave energy array built in its home country. The loan facility is significant for two reasons: it is probably the first ever pure debt facility provided to the nascent wave energy sector; secondly, it could provide the catalyst to arrest the history of Australian developed technologies shifting to overseas markets. Carnegie is current building the Perth wave energy project off the Garden Island naval base, which is the world’s first multi-machine wave energy project (it has three of its CETO-5 machines, pictured above), and the first demonstration of its ability to provide emissions-free desalinated water. However, the next project will feature CETO-6 machines, which will be twice the size of CETO-5 – at around 500kW each – and will be the first at what the company expects will be commercial scale size machines. Carnegie has been looking at four sites for that project – two in Australia (including Rottnest Island) and two overseas. CEO Michael Ottaviano said the CEFC funding boosted the chances of it occurring in Australia. In fact, he said, the loan facility is dependent on it. Carnegie has yet to release the scale and costs of the CETO project, although it is likely to start as a 3-machine installation before being expanded – likely to 20MW or beyond. Scale is the key to cost reductions. CEFC CEO Oliver Yates told RenewEconomy that obtaining debt funding was a critically important transition that every company had to go through as it moved towards commercialisation. Ottaviano said preliminary design for CETO-6 is happening now, and talks are being held with state governments over site tenure. However, because sites are a critical part of the equation, Carnegie will continue to progress offshore sites, at least for the time being. He hopes the CETO-6 project will be in construction in 2016. Carnegie last year raised $4 million in a convertible debt issue, which is considered to be a debt equity hybrid. All its other funding has come from equity and government grants. Ottaviano says he believes that the CEFC facility is the first pure debt facility ever for a wave energy project. “It is important and ground breaking,” he said. “It allows us to engage in a whole new pool of capital, and we can start having serious conversations with those debt providers. Ottaviano says Australia should be a world leader in wave energy, given its technology breakthroughs, its excellent wave energy resource, and the technology capabilities built up in the offshore oil and gas industries. “We believe there is significant potential for Australia to be a leader in this field which can create new industry and export opportunities,” he said in a written statement. Yates agreed, saying Australia has the wave energy resources and the skills to become a major player in the global wave energy sector. “This is an industry of the future with great potential for Australia,” he said. The World Energy Council has estimated that approximately 2 terawatts (2 million megawatts), about double current world electricity production, could be produced from the oceans via wave power. 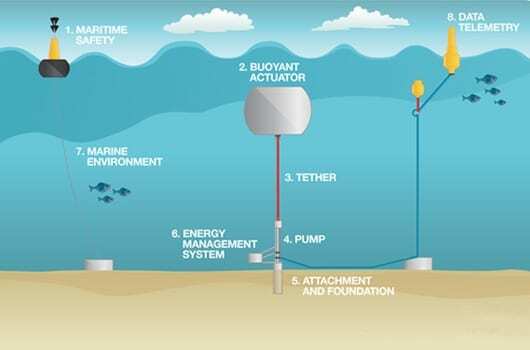 It is estimated that 1 million gigawatt hours of wave energy hits Australian shores annually (Australia’s current renewable energy target is 41,000GWh, and its total consumption less than 250,000GWh). In 2011, the UK Carbon Trust estimated that the Global Marine Energy sector could be worth US$760 billion by 2050 and could support 68,000 jobs in the British Marine energy sector alone. CEFC says the new financing model is designed to fund the development of a specific project but upon drawdown places security over the assets of the company including any cash refunds the company will receive under the R&D tax incentive. While technically a corporate loan, upon drawdown, which is at Carnegie’s election, this facility has a high level of structural controls akin to those found in project finance transactions. The $20 million 5 year term facility is provided at commercial rates and fees with no concessionality. The establishment fee and commitment fees for 2014 can be paid by Carnegie through the issue of 15 million ordinary shares in Carnegie. The shares are to be issued in 3 tranches of 5 million. The first tranche of 5 million shares was issued by Carnegie on execution of the facility agreement. Further details of the facility terms will be provided once Carnegie draws down debt under the facility.